Happen to have a recipe for this little gem? I'd like to give it a shot at the "secret" lake once the snows gone, that is. it'll get bit David..If you wait for the snow to be gone you'll be to late Mark! 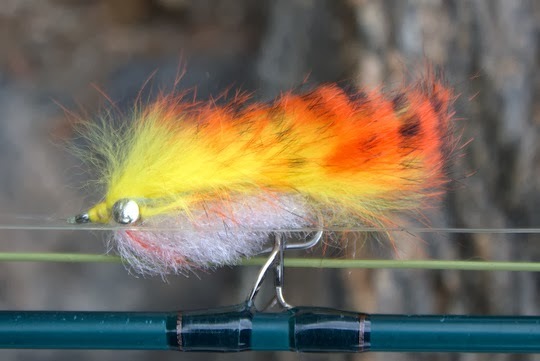 I tied a similar streamer using saddle hackle. I thought it would make a great brookie pattern. Don't know if I ever fished it. Yours should work on brookies and rainbows. David, I am with Mark on this one. A recipe or a sample would be an ideal gift for a BlogBuddy! I tied one very similar to this. Fantastic movement in the water and fish could not resist it.